In the plaza you can enjoy a very reasonably priced meal while finding yourself surrounded by palm trees. During the day the plaza is frequented by shoppers but at night the place is transformed as the many restaurants and bars spring into life. The atmosphere is relaxed and jovial. The plaza offers something of all individuals, including families and young couples. And the good news is that this plaza is within easy walking distance of the apartment. 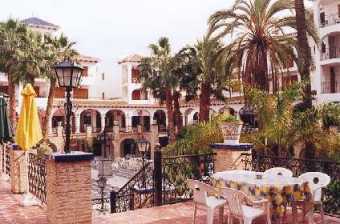 Torrevieja is a beautiful Spanish town located about a 20-minute drive from the apartment. The town lies along a wide coastal plain, with its face to the Mediterranean sea and its back to the nature reserve of the lagoons of Torrevieja. The coast is made up of many beaches, with many offering all kinds of water activities. The town itself has a substantial promenade with a selection of bars and restaurants along the sea. 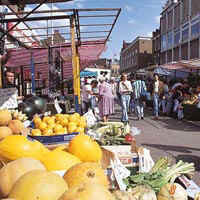 Every Friday one of the largest street markets in Europe can be found. Here you can find everything at reasonable prices. An abundance of good restaurants and nightlife provide a fitting end to a day of fun filled shopping.